My husband and I have always been an active couple and my family has proven to be that was as well. Even though it is super hot outside, I still like to find a hiking path with the dog in tow and look for some water. 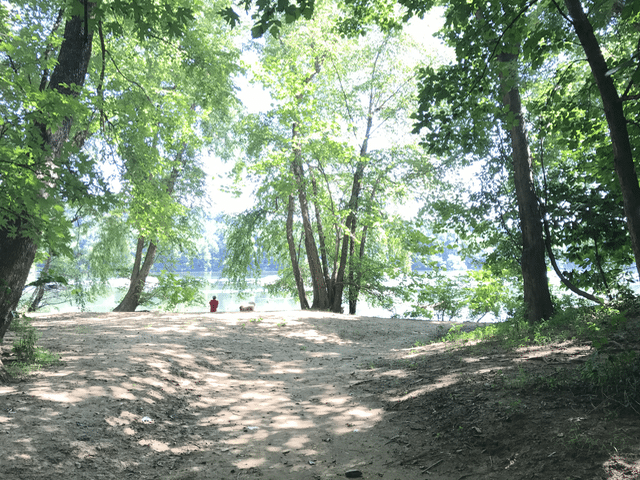 We live along the James River, so there are miles of trails that may just lead us to an unexplored adventure. 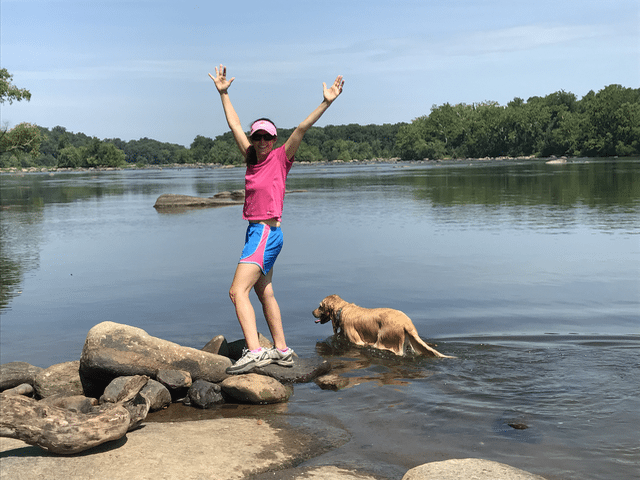 There are so many great things to do in Richmond, Virginia. 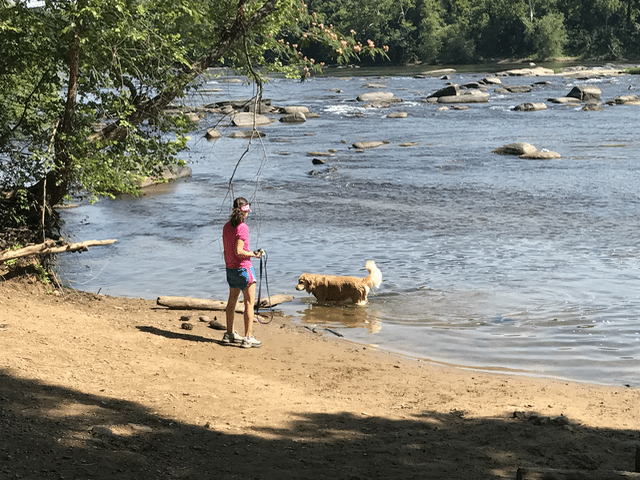 After several hot days in Richmond, VA we decided to take the dog on an adventure and check out our beautiful river parks. There is nothing better than finding an empty trail that has plenty of shade. No matter what time of year you find yourself on this trail, there is always something interesting. 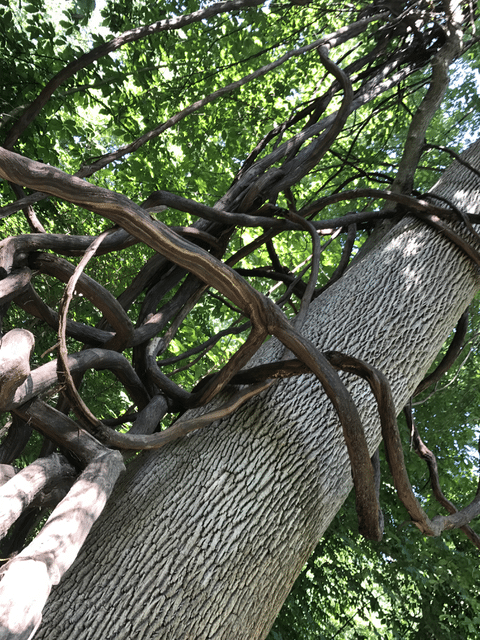 Check out this crazy Tarzan like vine climbing up this tree. Our first stop was a little beach area where Chloe likes to try to “catch fish”. Never successful but it must feel nice and cool on this hot day. 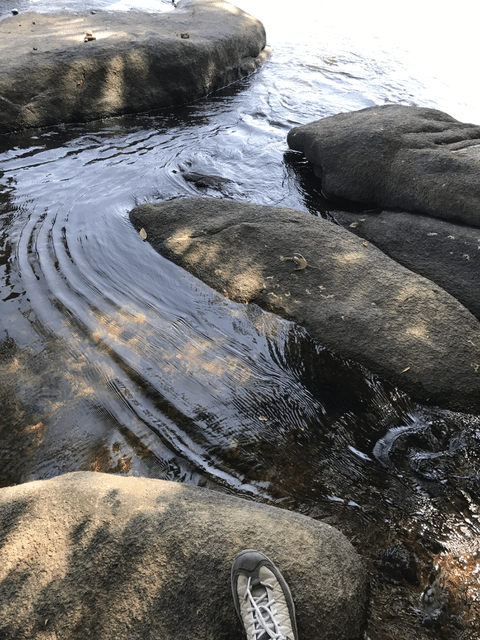 Our next stop took us to a little area where rock hopping seemed like a good idea. I was a little nervous with my new ACL and all but the rocks were not slippery. I made it to the other side. Hard to tell from this picture but I am on a little rock island. Sometimes you don’t have to go very far to find an adventure. Check out your own town for hiking trails. 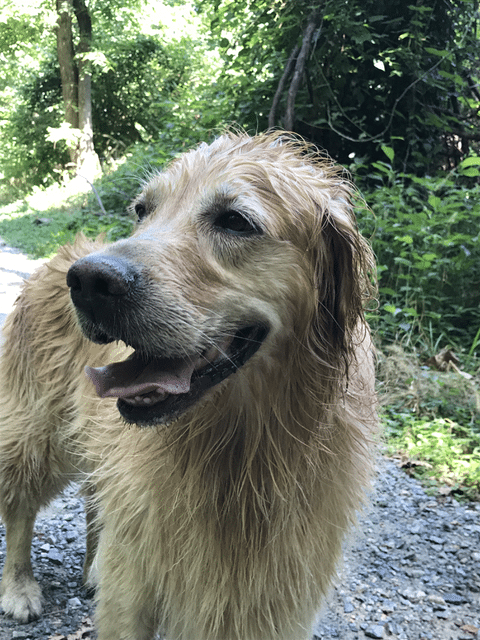 End result is one happy dog and one hot hiker. I am so grateful for this time with my 6th member of my family. After a long hot day exercising and watching the dog cool off, how do you unwind? With a chilled bottle of Sheep Thrills® Pinot Grigio of course! 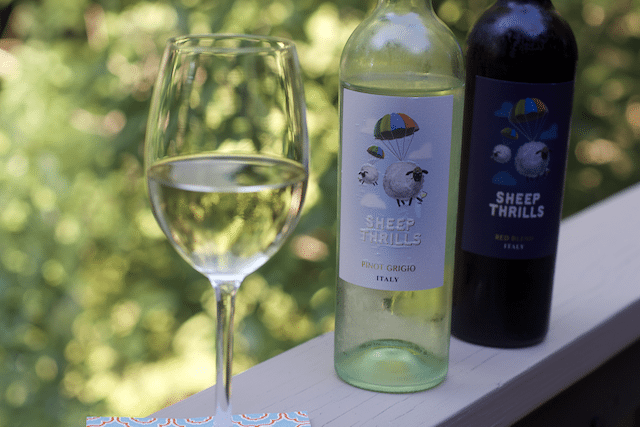 Sheep Thrills Pinot Grigio is made in Abruzzo, Italy and is full of fruity flavors. Sheep Thrills Pinot Grigio has delicate, floral and fruit aromas that is rather refreshing after a long hot adventure in the summer. Pinot Grigio is a light wine that goes great with light dishes like cheese and crackers, the perfect snack after coming off the trails. If you prefer red wine, you might want to try Sheep Thrills® Red Blend, which is a red table wine. Sheep Thrills Red Blend would be great chilled in the summer or turned into a sangria. What are your favorite summer adventures? 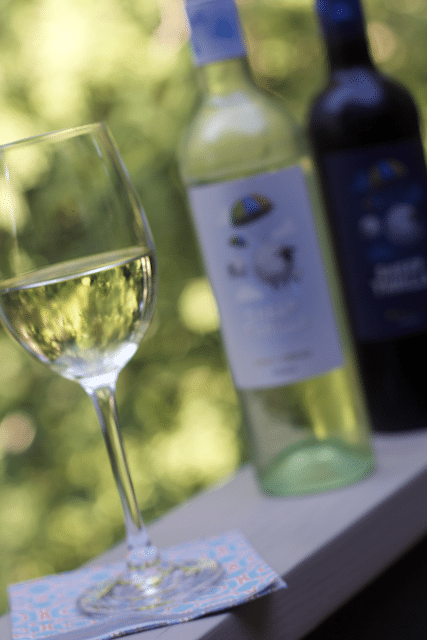 Do you prefer red or white wine after a summer adventure? We have had a busy busy summer , we plan on doing a bit more as well but a glass of wine sounds fantastic to end a summer activity with! 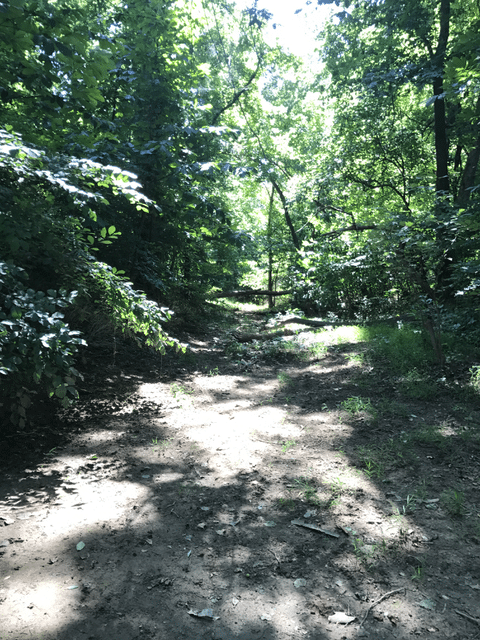 Looks like a nice hike trail in the first few pictures ! 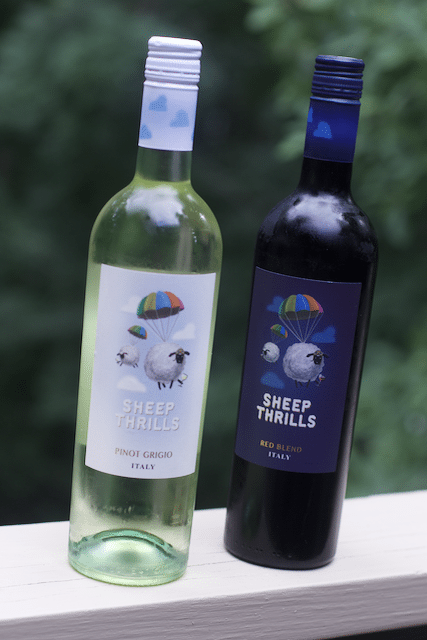 Sheep Thrills is such a fun name for a wine. I can see that being a real conversation starter. Unwinding after a long fun day, with a glass of wine is my kinda day! Looks like you had a fantastic adventure with your sweet dog. Looks like you know how to unwind! Summer adventures are great, but I know my body is like woah slow down some days and after a long adventurous day with the family, I could totally use a nice sip of a good drink! My kiddos and I have been spending much of the summer just chilling at home. After a busy school year, we wanted some time to just sit around for a bit!